3/8" Glue Dots are double-sided,, ultra thin adhesive dots for permanently mounting photos and greeting cards. 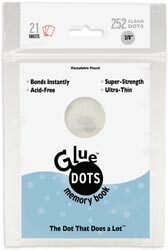 Glue Dots bond to photo paper, heavy card stock, textured papers and lightweight embellishments are are ideal for paper crafts of all kinds. These are GREAT for larger buttons and bows!